Considered one of the most under- utilized produce picks, fennel is full of suprises and bursting with flavor. To prepare fennel, cut away the stalks and leaves from the bulbs, saving them to flavor vegetable stock, or for use in other dishes. Discard the outer layers of the bulb and cut away any discolored areas. Cut the bulb in half lengthwise and slice out the core, which is the thick solid center. Gently separate the bulb layers by pulling them apart. Rinse well in cold water several times to remove any grit. Slice or dice them to use in recipes. Refrigerate fennel for up to 4 days. Wrap the fennel in moist paper towels and place it inside a plastic bag. Use fennel in place of celery in soups, casseroles, salads. Use the feathery leaves as an herb on seafood or pork dishes, for best flavor add in at the last few minutes of cooking. Finely chop fennel and add it to potato salad and coleslaw. Combine fennel and sweet onion in a skillet, add a little olive oil, and cook over medium heat until tender. Serve as a side dish with roast beef. Grill fennel and top a cheese pizza or burgers. Use fennel seeds in chili, meat balls, lasagna. One cup of sliced fennel contains about 35 calories and 3 grams of dietary fiber. Fennel is a good source of vitamin C and potassium. Fennel is naturally low in sodium. The oil in fennel is anethole, which contains antioxidant and antimicrobial properties. A strong anise flavor and smell is an indication that the bulbs are fresh. Fennel is available year round, and the best time to buy is spring and summer. 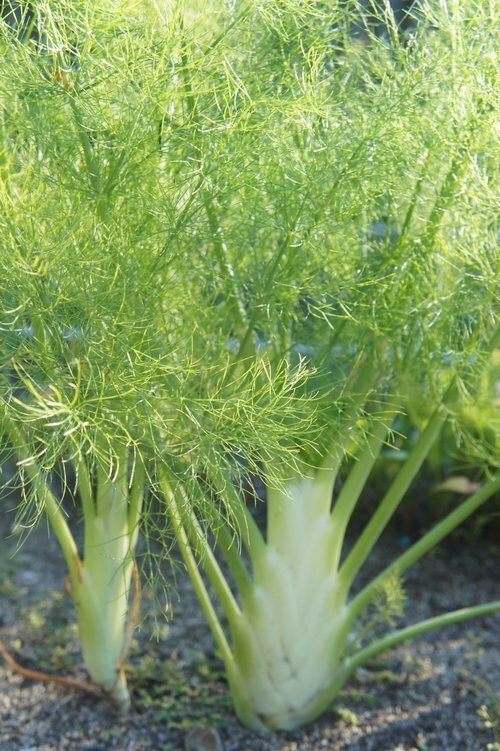 Choose fennel that has a crisp, white bulb and bright green leaves.